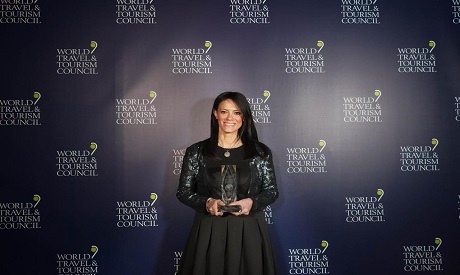 Egypt’s Minister of Tourism Rania Al-Mashat has been awarded the World Travel & Tourism Council (WTTC) Global Champion Award at the 2019 Global Summit in Seville, Spain for her country’s work on promoting tourism resilience, a statement by the organisation said on Thursday. Receiving the award in on Wednesday, Al-Mashat said that the Egyptian Ministry of Tourism has adopted a new approach, the Egypt-Tourism Reform Program (E-TRP), to modernise the sector by implementing structural reforms that strengthen Egypt’s competitiveness and are in line with international standards, according to the WTTC statement. "I’m honored to receive the “2019 Global Champion Award” for our country’s efforts in promoting tourism resilience from the World Travel & Tourism Council @wtandtc at the Global Summit today," Minister Al-Mashat said in a statement on Thursday. Minister Al-Mashat has recently announced that one of Egypt's objective in developing tourism is to have at least one individual from each Egyptian household working directly or indirectly in the sector. President Abdel-Fattah El-Sisi has recently received an award from the UNWTO for his commitment to tourism and its contribution to the country’s 2030 agenda for sustainable development. The tourism sector of Egypt has, under the leadership of Al-Mashat, led a robust recovery after receiving a big hit in 2011. In 2018, Egypt’s travel and tourism sector continued its impressive growth (16.5 percent), according to WTTC data, ahead of the global average of 3.9 percent, the WTTC said in a press release. “This growth has been linked to the hugely improved security infrastructure, which has helped to attract international visitors back to Egypt’s shores, and has allowed major global travel companies to restart operations in popular destinations and increase their business in new tourist developments on the coasts of the Red Sea and the Mediterranean,” the WTTC added. According to the WTTC, "the annual WTTC Global Champion Awards recognise outstanding public officials or countries who, through their leadership, have made a difference through pioneering public policies and initiatives that have increased the competitiveness of the sector within their respective countries." "The WTTC Global Champion Award for Resilience recognises strong leadership by a country which has demonstrated success in recovery from adverse events." The award was presented at the Gala Dinner of the WTTC Global Summit in Seville on Wednesday. "This is just the beginning for #Egypt, the future forefront of tourism," Al-Mashat said in her statement.